Ambling round our local hardware store for some essential holiday toiletries, the seed display caught my eye. Happy days, the half price sale is ON! 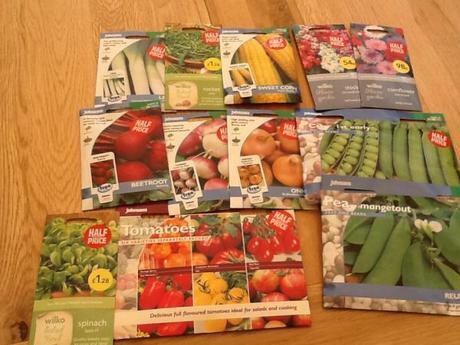 In brief – six varieties of tomatoes, rocket, spinach, sweetcorn, turnips, beetroot, onions, two kinds of peas, leeks, and oh, some flowers for good measure. All for about a tenner… you can’t say much fairer than that. I updated the old spreadsheet, so I’ve got some clue about what goes in where and when. All I can say, is watch out next January!